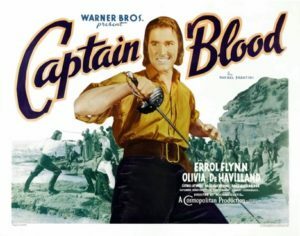 After the success of swashbucklers Treasure Island and The Count of Monte Cristo, Warners decided to go all-in on a remake of Rafael Sabatini’s Captain Blood. (There’d been a silent version in 1924, now lost.) The stars they initially had in mind for the leads bowed out, and in the end the studio took a huge risk and cast two complete unknowns: Errol Flynn and Olivia DeHavilland. Luckily, they were both excellent, ideal for the rôles—and even better, they had great on-screen chemistry together, so good they were paired seven more times in the next ten years. The director’s chair went to studio veteran Michael Curtiz, who in 1938 would direct another swashbuckling essential, The Adventures of Robin Hood, before his career pinnacle helming Casablanca. Add in Basil Rathbone as the villain, supported by a slate of the best character actors in Hollywood, with a stirring soundtrack by Erich Wolfgang Korngold, and you have the makings of a true classic. The story starts in 1685 during Monmouth’s Rebellion against England’s King James II. Dr. Peter Blood, treating one of the wounded, is swept up among the captive rebels and sentenced to death in the Bloody Assizes, where we first get a sense of his indomitable character. Throughout the film Blood is aflame with a mocking defiance of oppression and tyranny, but Flynn’s characterization also sparkles with wry intelligence, as he delivers razor-sharp remarks with such conviction it seems he’d thought them up himself. Blood’s sentence, and that of his fellow rebels, is commuted to slavery on the plantations of Jamaica, and the crew is shipped off to Port Royal. At a degrading slave sale, Blood catches the eye of Arabella Bishop (Olivia DeHavilland), daughter of one of the plantation owners, and in order to save the sullen Irishman from being bought by the most brutal man on the island, she buys him herself—now there’s a “meet cute” for you! The film’s next half hour is this amazing back and forth as the story contrasts the luxury and brutality of colonial Jamaica, with Blood step-by-step engineering an escape attempt by himself and his fellow slaves, meanwhile currying favor with the governor (only Blood can cure his gout) and engaging in a half-unconscious courtship dance with Arabella. (Neither of them really mean it—or do they?) Then the escape plans go awry and all seems lost, until the “timely interruption” (as Blood himself puts it) of a raid by Spanish pirates. The slaves take advantage of the chaos to turn the tables on both Spanish and English, and after some derring-do, Blood and his crew are free and in command of a fighting ship. And then, with all the world their enemy, what should they do but sail to Tortuga and join the Brotherhood of the Coast? But when you ally with pirates, you must consort with such scoundrels as Captain Levasseur (Basil Rathbone)—and that might not end well. But oh, those scenes of Caribbean piracy: the buccaneers swearing to the Articles, drunken pirates pillaging a seaport, freebooters roistering in the taverns of Tortuga, the boarding actions—“Grappling hooks to larboard!” They’ve all been done many times since, but never better, to my mind. The rapier duel in the surf between Flynn and Rathbone over the captured DeHavilland is worth the price of admission alone. Guilty pleasure: Basil Rathbone’s outrrrrrageous French accent.